I'm spending the morning putting the finishing touches on all of my custom orders. Last week's sickness put everything on the back burner, and I'm so happy to be catching up. Five organic buckets, four pillow slips, three sweet banners , two printed journals, and a partridge in a pear tree! 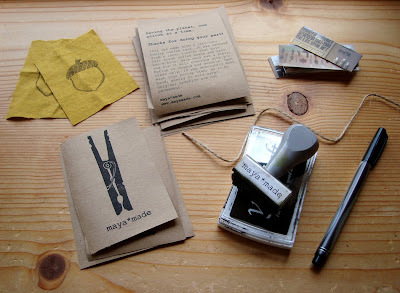 As I tie up little packages, my mind drifts to all of the holiday ideas that are keeping me up at night. My next series of Simple Gifts is brewing, as well as fun things to fill the shop. I wish for more hours in each day every time the clock strikes midnight. Oh well, we can only do so much, right? In the mean time... the lists have begun! Are you a lister, too? I've dedicated an entire notebook just to this season! Happy Wednesday! So great that you are feeling much better and getting caught up. I clicked through the Simple Gift link and saw your natural first aid kit, which is great. I have a big one I keep in the car when we are out, but this would be a perfect patch up kit to throw in the diaper bag, thanks for the tutorial and idea. I am so glad that everyone is feeling better at the maya*made headquarters. I can't wait to see what you come up with for the holidays. I will definitely be tuning in! I am an obsessive lister! I feel lost without them. YES! I make lists and then, freak when I can't find it. So glad you are all on the mend. Oh, wouldn't more hours in the day be wonderful! That or the ability to function - and function well - without sleep! I'm a lister for sure. Things I want to make, to bake, special shops to visit, specials to watch... Christmas is definitely one of my favourite times of year! Yes I am a lister, haha! Although I have one notebook and it gets carried around with me until it's full. Projects and wishes would be chaos without it! Oh Sweeeet Lists....I Love them. I name them and my husband knows not to mess with them.....maybe my love of lists is, maybe, a little unhealthy??? Who doesn't love a good list. I have them coming out of my ears, lists to do, lists to buy, lists of future projects! Like you say, there are never enough hours in the day. Glad to hear that the household is recovering from sickness.